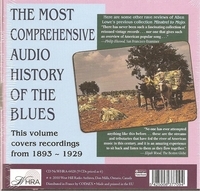 "Allen Lowe, who compiled the set of 9 CDS, has carefully articulated the larger musical picture of blues by assembling spirituals, folk songs and jazz tunes that have been identified as blues-based compositions be the artist white or black. The sound of these old, lo-fi, monophonic 78s and cylinder recordings is as clean and clear as I’ve ever heard from a major label. But getting past the sound fidelity is the whole point here because it’s the music, the voices and the spirit of real performances that has been effectively captured. The remarkable musical and historical journey on disc is aided by Lowe’s companion essay on a CD-ROM. Highlights include 'Viola Lee Blues' by Cannon’s Jug Stompers and 'Crucifixion' by pianist, Arizona Dranes. The set also includes inspired performances by Jelly Roll Morton, Bessie Smith, Ma Rainey, Johnny Dodds and Lonnie Johnson. These artists are mixed into a collection that includes early Minstrelsy, Appalachian Folk songs, Gospel and New Orleans Street bands."